This chapter provides an overview of Zero Downtime Patching, including the types of workflows that you can create, how the patching workflow proceeds, and how patching is reverted. What is Zero Downtime Patching? WebLogic Zero Downtime Patching (ZDT Patching) automates the rollout of out-of-place patching or updates across a domain while allowing your applications to continue servicing requests. After defining your patching strategy, you can use either WLST or the WebLogic Server Administration Console to orchestrate the rollout of updates across some or all of the servers in your domain. Although WebLogic Server has supported rolling upgrades since version 9.2, the process has always been manual. ZDT Patching automates this process by using workflows that you define. You can patch or update any number of nodes in a domain with little or no manual intervention. Changes are rolled out to one node at a time, allowing a load balancer such as Oracle Traffic Director to redirect incoming traffic to the remaining nodes until the node has been updated. ZDT Patching supports the following tasks. You can create a workflow that performs any one of these tasks. You can also create a workflow that performs any combination of an Oracle Home update, Java version update, and application update. 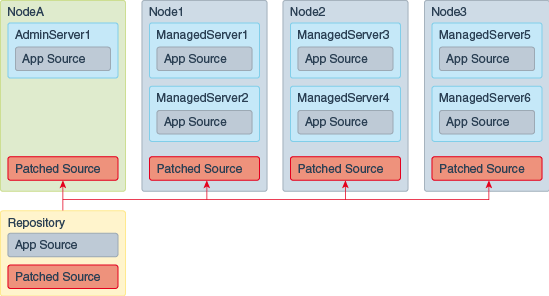 Moving servers to a patched Oracle Home—The workflow transitions the Administration Server or clusters or both to another Oracle Home that has already been patched using OPatch. Updating to a new Java version—The workflow updates the Administration Server or clusters or both to use a newly installed Java Home. 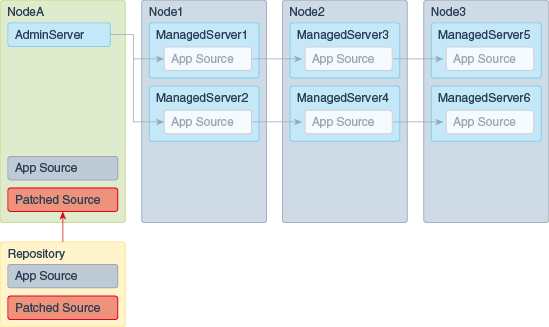 Deploying updated applications—The workflow deploys updated applications to the selected clusters. Performing a rolling restart of servers—The workflow will sequentially restart the Administration Server or servers in the selected clusters or both safely, including graceful shutdown of the servers and starting them up again. Prior to creating a patching workflow, preliminary steps must be completed for each of these tasks with the exception of rolling restarts. See Chapter 2, "Preparing for Zero Downtime Patching," for more information. Calls Node Manager to switch the contents of the current Oracle Home to the contents of the specified Oracle Home. Updates all scripts in the domain's home directory that contain a reference to Java Home to point to the new Java Home. Moves the directory for the new version of each application to the location of each original application. Restarts each server once the update has completed on the node. The workflow executes the appropriate steps in order and monitors the success of each step. If a step fails, the workflow may attempt to retry it. If a step cannot be completed successfully, the workflow reverts each previous step in order. The revert process can be configured to execute automatically or can be initiated manually, as described in the next section. Automatically—When creating a workflow, you can opt to have the update revert automatically if there is a failure. The update will be rolled back from the point of failure, starting with the last successfully completed step. Manually—While a workflow is in progress, you can stop it and revert it at any point. The update will then be rolled back, starting with the last successfully completed step. After a workflow has completed, you can revert it by creating a workflow to reverse the update that was made. This differs slightly depending on the update you are reverting. If reverting to the previous Oracle Home, you are provided with an option to specify that it is a rollback. For Java and applications, you simply point to the previous version of Java or the application. For more information on reverting an update, see Executing, Reverting, and Resuming Stopped Workflows. All Managed Servers in all clusters that will be included in the rollout must be running. See ZDT Patching Restrictions, for additional requirements and restrictions. Figure 1-1 at the end of this section shows the operations that are performed for an Oracle Home rollout on each node, regardless of whether you use OPatchAuto, WLST, or the Administration Console to perform the rollout. Create the patched Oracle Home archive. For details, see Creating a Patched Oracle Home Archive Using OPatchAuto. Distribute the archive to all nodes to which you want to roll out the patched Oracle Home. For details, see Distributing the Patched Archive to Each Node Using OPatchAuto. Use the copyBinary command to create an archive of your existing Oracle Home. For details on this step and the next step, see Creating a Second Oracle Home. Use the pasteBinary command to create an Oracle Home to be patched on a development or test system that has a similar domain topology as your production domain. This gives you an Oracle Home that has the same patch level and products as you have on your production system. Use the Oracle OPatch tool to apply the desired patch or patches to the Oracle Home on your development or test system. For details, see Applying Patches to the Second Oracle Home, and Patching with OPatch. Test and verify the patched Oracle Home. Once you are satisfied that the patched Oracle Home is stable, use copyBinary to create an archive of the patched Oracle Home. For details on this and the next step, see Creating an Archive and Distributing It to Each Node. Distribute this archive to all nodes in your production system. There is no need to use pasteBinary to explode the archive on each node. The rollout process will create the new Oracle Home on each node from the archive. If you did not use Node Manager to start your Administration Server, shut down the Administration Server and use Node Manager to start it. For details, see Using Node Manager to Start the Administration Server. Use OPatchAuto to initiate the rollout and specify Administration Server as the target. For details, see Using OPatchAuto to Initiate a Rollout. Use the WLST rolloutOracleHome command and specify the Administration Server as the rollout target. For details, see Rolling Out a New Oracle Home. In the Administration Console, select the ZDT Control > Servers tab, select the Administration Server, and then initiate and configure the workflow. For details, see Creating a New Workflow for a Domain, Clusters or Servers. Use OPatchAuto to initiate the rollout and specify a cluster or a comma-separated list of clusters as the rollout target. Use the WLST rolloutOracleHome command and specify a comma-separated list of clusters as the rollout target. In the Administration Console, select the ZDT Control > Clusters tab, select the Clusters to which you want to rollout the Oracle Home, and then initiate and configure the workflow. You can combine the last two steps into one workflow by either specifying the domain as the target in the opatchauto or rolloutOracleHome command, or by initiating and configuring the workflow from the ZDT Control > Domains tab. See ZDT Patching Restrictions, for additional requirements and restrictions. Install the new Java version to all nodes. The full path to this Java Home must be the same on all nodes. For more details, see Preparing to Upgrade to a New Java Version. Use the WLST rolloutJavaHome command and specify the Administration Server as the rollout target. For details, see Updating Your Java Version. Use the WLST rolloutJavaHome command and specify a comma-separated list of clusters as the rollout target. In the Administration Console, select the ZDT Control > Clusters tab, select the clusters to which you want to rollout the new Java version, and then initiate and configure the workflow. You can combine the last two steps into one worfklow by either specifying the domain as the target in the rolloutJavaHome command or by initiating and configuring the workflow from the ZDT Control > Domains tab. See ZDT Patching Restrictions, for additional requirements and restrictions. Figures (UNKNOWN STEP NUMBER) through (UNKNOWN STEP NUMBER) at the end of this section illustrate the scenario for staged, no-stage, and external staged applications. The patched application source will be moved to the appropriate application source locations for each stage type during the rollout. (Stage mode) Place a copy of each updated application directory on the domain's Administration Server. (No-stage mode and external stage mode) Place a copy of each updated application directory on each node that will be affected. The directory must be the same on each node. For details, see Impact of Staging Modes. Create a JSON file that defines each application name, the path and file name for each updated application archive, and the path and file to which you want to back up the original application archive. For details, see Creating an Application Update JSON File. Use the WLST rolloutApplications command and specify a comma-separated list of clusters as the rollout target. In the Administration Console, select the ZDT Control > Clusters tab, select the Clusters to which you want to rollout the applications, and then initiate and configure the workflow. For webapps that use in-memory session replication, the in-memory sessions are never replicated or persisted to allow for failover, as a result of which webapps may lose session state due to a server crash or frontend misdirection causing the request to land on a sever without the session. With regard to Zero Downtime (ZDT) rollouts, when you shut down any server that holds the in-memory session, the server waits for that session to complete before shutting down. Since the default value for session timeout is one hour, the server may be in the SUSPENDING state for one hour or even longer if sessions continue to be utilized or updated. If you do not wait for the session to complete its lifecycle, then the state is lost as in-memory sessions are neither replicated nor persisted for webapps. If you do not want to wait for an hour or longer, it is recommended that you set the shutdownTimeout option argument to the time (in seconds) that you want the server to wait before shutting down. For information about using the shutdownTimeout option argument, see Table 3-1, "Arguments for WLST rollout Commands".